IsoTek says Aquarius will clean up your mains | What Hi-Fi? IsoTek has unveiled the successor to its Mini Sub mains conditioner, the £795 Aquarius. Aquarius has two high-current and four medium-current outlets, all individually filtered and fully isolated from one another, plus a newly-designed aluminium casing. 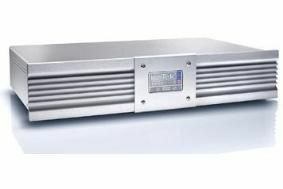 Current delivery is greater than the GII Mini Sub, with a full 16 Amps available from its two high-current outlets. A 16A IEC C20 connector offers superior current delivery from the mains, says IsoTek. The four medium-current outlets feature Isotek's Adaptive Gating technology – an auto-sensing filter stage that adapts to the current draw of the load, thus tailoring the filtering process to suit each individual piece of equipment attached. And Aquarius will also protect your hi-fi and home cinema equipment from spikes and surges in the mains power supply. The IsoTek Aquarius will be available from the end of October in silver or black.